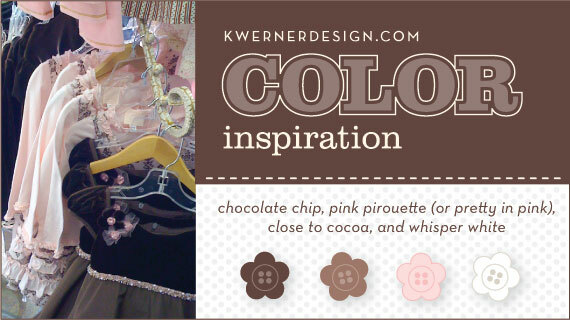 It’s time for another Color Inspiration Challenge! This week’s photo came from a children’s clothing boutique I visited a while back. I’ve always loved brown and pink together and it’s always felt so… girly! I love it! Join us: Make a card/scrapbook page/whatever in the colors above. Color Inspiration virgins, please read the Color Inspiration FAQ first. Deadline: Saturday, March 7 at 7:00 pm MT. You will know when the deadline has past because you will not able to submit a new link through the Mister Linky box. Grab this week’s swatch-only image. (If you’re having trouble saving the swatch-only image, try right-clicking on the link and then on “open in new window”). I reserve the right to delete links that are posted incorrectly. Has your link been deleted? There’s probably a reason why. Check the FAQ.